Leadership | Move Your "..BUT God .."
LEADERSHIP. What is the essence of true, biblical leadership? This post is not to pat myself on the back, no way, no how. Rather, it’s about God’s perspective on leadership. One thing I’ve always believed is that leadership means being a servant of others, not a lord or boss over others, not a controller of others, not top person on the totem pole, but a servant of those you work with, and yes, where the buck frequently stops. As such, it’s a role or responsibility demanding integrity, good judgment, and teamwork ethic regarding others as equally important and essential to accomplishing the group goal. I’ve never sought to be the leader of anything, but sometimes I’ve been voted in or asked to lead, which was the case with the Message Research Team. The coordinator had moved, and the pastors needed someone to get the message topics and hand them out to the other volunteers on the team; thus I became coordinator of the team by being asked, not by seeking out acclaim. I saw myself pretty much as a funnel, not a “commander,” and that suited me just fine. Again, Jesus modeled a life of loving, sacrificial service to show us what true leadership is. A shepherd is a leader, but he leads in order to protect and help his sheep grow in health, safely, free from danger and lack of what they need. When threat comes from lions or bears, the shepherd risks his own life for his sheep – he doesn’t consider his sheep expendable and use his sheep as a shield to protect his own life! That doesn’t seem to leave much room for,”Hey, listen up! I’m the boss, and you’ll respect me just because I’m the boss and do as I say, because you are here for ME” in Christian leadership. Honestly, does anyone, whether in Christian work or secular work, enjoy working for someone who has an attitude of entitlement? I’ve experienced that, and I’m guessing you have too, and it doesn’t make getting up for work every morning a delightful, positive, hopeful prospect. In the 13 years I worked as a substitute teacher, often the first question children in classes asked me was, “Are you a nice sub or a mean sub?” I replied that it depended upon them, but of course my true attitude was that I was there to serve those children, follow the lesson plans of the absent teacher as closely as I could (if I even could find plans to follow) and give the children a positive day of real learning, attending to their needs, answering their questions, helping them with difficulties, and hopefully adding some fun to help install in them a love of learning. Yes, I was the”boss” of the classroom that day, but that meant I was there to serve those students, not myself. I heard about subs who would come into the classroom, tell the students, “read this, do that,” put their feet up on the desk and read the newspaper, and act miffed when a student asked a question. Don’t do anything only to get ahead. Don’t do it because you are proud. Instead, be humble. Value others more than yourselves. None of you should look out just for your own good. Each of you should also look out for the good of others. As you deal with one another, you should think and act as Jesus did. In his very nature he was God. Jesus was equal with God. But Jesus didn’t take advantage of that fact. Instead, he made himself nothing. He did this by taking on the nature of a servant. He was made just like human beings. He appeared as a man. He was humble and obeyed God completely. He did this even though it led to his death. Even worse, he died on a cross! So God lifted him up to the highest place. God gave him the name that is above every name. When the name of Jesus is spoken, everyone will kneel down to worship him. I hope, then, I’ve been on track in seeing any leadership position I’ve been “elevated to” as actually lowering myself to serve the people who were doing the job with me, counting on me to keep people informed, picking up the slack when someone couldn’t fulfill their role. Yes, you matter, no matter what your gifting or calling, and yes, in some way, then, you are a leader. to the person who needs to see Jesus in you. 12 For just as the body is one and has many members, and all the members of the body, though many, are one body, so it is with Christ. 13 For in one Spirit we were all baptized into one body—Jews or Greeks, slaves or free—and all were made to drink of one Spirit. A “…BUT…” to pray: Lord, sometimesI’ve wanted to be a leader,sometimes I’vewished peoplewould see my capabilities, BUT I know you know how you made me,who you made me,and what purposes you mademefor.So GodAlmighty, loving Father, please show me where I fit in the Body of Christ and give me the courage to walk out your purposes for me with the same attitude Jesus had: that of a gladly serving servant. Give me an attitude adjustment if and where I need it, and I know when you do, it will be out of your Father love for me. Holy Spirit, I’m listening ___________________________________________________ In Jesus’ name, amen! “Gosh, I can hear the Bible as I’m riding,” I thought as I pushed a little faster than I wanted to and shot down the hill on two thin tires at 38 miles per hour, keenly aware there was nothing between my skin and the asphalt but a thin jersey and bike shorts. Others must surely have seen the same parallels riding on the back of a tandem road bike; now I entered their cadre, not entirely willingly. I ride with a man who loves cycling. Before I met him I enjoyed riding my bike to the grocery store and back, and noodling around the neighborhood on evening pleasure rides. He, however, is of the “conquer the hills, the faster, the better” squadron, and he knows I’ll love riding once I get more miles under me and build up my endurance. Humph. I look at the hill he’d love to climb, at least an 8% grade all the 20-mile way to the top of the mountain, and I shudder. I never want to be THAT fit! When we ride independently, I usually “flake off” at the eight-mile mark, cut across a road lined seasonally with wildflowers and with a walking/biking path where I’ll generally find someone to stop, say hello to, and pray with. The surprise of a perfect stranger offering to pray for them delights me. I am God’s carrier pigeon on two wheels, bringing a word of His love to someone in their day, and I have fun being part of the “air drops” He allows me to make. But when I’m on the back of the tandem …. new rules apply. I can’t see or control where we are going. Which brings me to this point: if he falls, I fall. I’m dependent upon his judgment and character. He has to put his muscle to the pedals, but if I so choose, I can pretty much rest in his strength when I’m tired. I can take my hands off the handlebars and sit upright because he’s steering. When my energy is used up, it’s up to him to get us home. He is responsible for my safety. 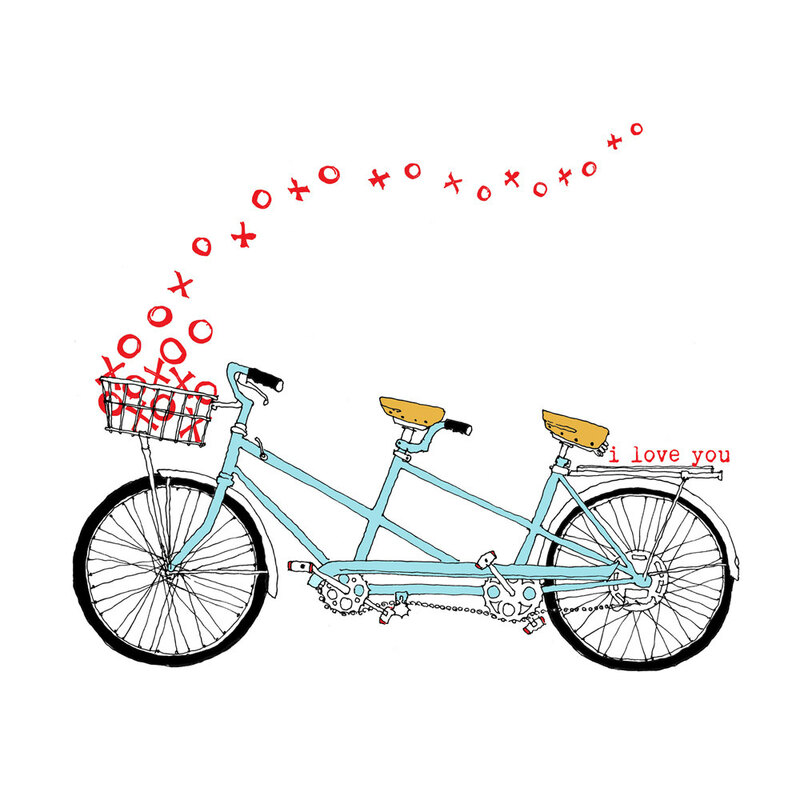 I have heard the test of a relationship is if you can ride a tandem without killing each other. The rule is: what happens on the bike, stays on the bike. But every time I click my feet into those pedals, the word “captivity” springs to mind: the state or period of being held, imprisoned, enslaved, or confined. BUT that is one perspective, half of the truth. The other truth is that riding on the tandem makes a way for me to be with my friend and do what i couldn’t do, without great exertion, on my own. I also know this is true about lasting relationship: “Perfect romantic love never does last, of course. Under the best conditions, it evolves into something more realistic and lasting, where two imperfect people discover one another’s virtues and faults, grow to appreciate the goodness in each other but also to accept the disappointments.” I have to add, though I’d rather not, learn to accept challenges to grow, stretch, get stronger. I’m half-crazy all for the love of you. But you’ll look sweet upon the seat of a bicycle built for two. The tandem truth is that, in sending Jesus, God made a way for us to receive what we can’t do out of our own strength or “righteousness”: ride with him, depending on his strength, endurance, blood, love. A rabbi’s disciples always walked in the dust of their teacher, following in his footsteps wherever he lead them. Jesus’ disciples did the same, and if I want to be His disciple today, I’m going to have to put in some miles. I can’t keep up with him our my own limited resources and “goodness,” but i can clip into the pedals behind him and ride where he’s going.The disciples were on two feet; I’m on two feet with you, Jesus, and sometimes literally on two wheels in the company of some of your competitive “conquer the mountain, harder, faster, longer, first” children who don’t know you yet, but need to. All I want to conquer is the enemy of my soul, not the pavement! Stop and smell the Texas sage, people! There are lonely folks to be prayed for out there…. but they ride on. Sigh. Do you not know? Have you not heard? The Lord is the everlasting God, the Creator of the ends of the earth. Oh, God, that’s what you want for me, isn’t it? Rats! I’d much rather noodle around the neighborhood and never get serious about going somewhere with the faith and gifts and strengths you’ve given to, and invested in, me. I’d rather quit when I feel tired, hop off when I want, go where I want at the speed I want and not be obligated to anyone for how long it takes me to get nowhere in particular. But I have a sneaking suspicion – and last week at a conference I heard a “name of God” for the first time: “Jehovah Sneaky” – that you want me to do something with the talents and desires and gifts you put in me, you want me to follow the road you planned for me, to go as far as You want to go, willingly stop when you stop, and trust your love for me whether I can see where we’re going or not. I recall speaking on this subject ten years ago, but then I hadn’t been required to walk down a road I never wanted to travel, for longer than I wanted to be in battle and in limbo. Now I’ve had to live it, and it hasn’t been rainbows, bunnies and flowers. It’s been hard, uphill, in the dark, in the rain, against the wind, and a challenge to keep my heart free from bitterness, anger, pulling away from you and fear every turn of the wheel. God, you told me two things over two years ago: “You’re worth fighting for” and “You are my chosen child. Don’t be afraid of what man tries to do to you.” You didn’t tell me where we were going, how long the road would be, or how steep the climb. I suspect my fear and inability to hang on made this trip take longer and be harder than it needed to be. Did I switch places and try to be the one in front? Did I let go of “manna” you gave me because I was grieving too hard? Well, I know you forgive me and your mercy is new every morning. I want to take the back seat now and let you pull me up the hill, pump hard when I can’t, stop when i/we need to, and yes, I desperately need to trust your character to take responsibility for my safety. A “…BUT…” to pray: God, I know you want my life to count and have meaning. I do, too, but honestly, “clipping in” with you makes me feel _____________________________________________________. I know you understand, because you know I’m human, and not seeing where we’re going , I feel ____________________________________________. But I know you love me and your plans for me are for good, not for evil, so as I ride with you, Jesus, I’ll give my best to _______________________________________________________________________________________ and I’m leaning on you, holding on to your character and love, and asking you to ______________________________________________________________________________________. When I start to lean, slip, get tired or want to quit and go home, please _______________________________________________________________. Thank you that you “know my frame” and you love me even in my weakness, as well as in my strength. I need your renewing strength to _______________________________________________________________________________. Thank you that you wont quit on me! In Jesus’ Name, Amen!